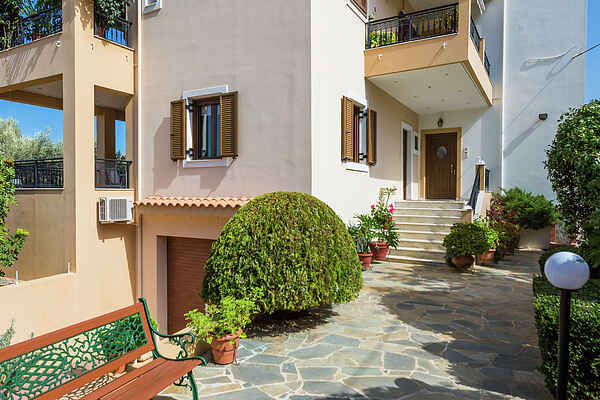 This new apartment complex is located at the entrance of quiet village Prines only 5 km from Rethymno city. The fenced and beautiful garden of 4000 m2 with BBQ, parking, many olive trees, colorful and fragrant flowers and a lush lawn, where the guests can relax under the hot sun, will make you feel comfortable and safe. The 3 well equipped apartments have one bedroom and comfortable living-dining room. The “Wine Apartment” interior is decorated in modern style with basic theme the wine, one of the traditional products and can accommodate 3 persons. The living room has one comfortable sofa-bed, the kitchen is fully equipped and the bedroom is spacious. On the big veranda, the guests can enjoy their breakfast with view in the garden. Prines village is a peaceful place, ideal for those who love nature. Olive trees are all around the area. The village has small mini markets and taverns. More shops, supermarkets, restaurants, a butcher's shop, a bakery and an Internet cafe in the bigger neighbouring village of Atsipopoulo (1 km). The sea is at 2 km, but the nearest organized beach is at the vibrant city of Rethymno. Also, near beaches are at Petres, Episkopi, Georgioupoli.